After butchering their prime time drama budget to make way for Jay Leno's abysmal talk/variety show weeknights at 10pm, NBC is now rumoured to be scrambling to dump 'Chinny' back to his old 11:35 pm timeslot. 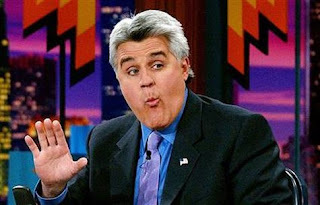 Is it any surprise that Leno's 10pm program is drowning in ratings oblivion? It's dull, he's dull -- all that audience running up to "high five" him -- SO lame, dated and irrelevant. Even his once-faithful viewers who previously were lulled to sleep by his whiney tones back in the midnight hour of old, have abandoned him...probably off watching 'The Good Wife' or some other compelling 10pm drama that NBC thought too pricey and ratings dicey to fund. Kinda funny when you think of the irony! I don't really care what happens to Jay Leno. I *am* annoyed that in order to save this old fart, NBC are willing to drop-kick Conan O'Brien from his newly anointed 11:35 pm to a later timeslot, like the 12:35 pm spot he previously occupied. Conan IS FUNNY! Leno is not! Doesn't take a college education to figure that one out. NBC is freaking, trying to save the ratings bleed by moving Jay back to where he was once comfy & successful, but seriously.... it just won't work!! The late night line-up shuffle from last Fall has finally settled in and found its comic groove. Conan is on a roll, and Jimmy Fallon who follows is just getting better and better. Young viewers can relate -- at last, a host who knows what time shifting and the internet are all about. Plus, his thank you notes are really funny. Can't get better than etiquette & humour wrapped up in one silly package! Having worked in television myself for many years, I'm completely dumbfounded at how the NBC brass continue to make such costly decisions time and time again. They totally deserve the ratings hell that they are mired in - but not at the expense of Conan, Jimmy or their faithful viewers. Perhaps it would be best if Conan jumped off this shinking network ship and got the respect and timeslot he deserves some place else. Can't say that I'd blame him. I've been following this mess via CNN. We get Conan on CNBC and he is funny. I thought Jay Leno retired so why is he stil doing a prime time chat show and I agree, Conan has got better since last year when I wouldn't watch him for toffee. Its unfair on him, he's finally settled in and now NBC are trying to oust him for Chinny Chinny Bang Bang? I think they should for once, listen to their audience and for once, would it hurt them to do something right. I worry for everyone at and coming into that network. Though I love 30Rock, now's the time to start looking for new talent and new comedy. Anyway, didn't they try to cancel that up until Tina Fey returned to SNL as Sarah Palin? They won't know a good thing even if it bites them on the arse.